It seems that anymore, the quality I have come to respect most in pop music, beyond of course artistic and musical ability, is honesty and lack of pretense. This can take the form of being iconoclastic or downright quirky -- so long as it's not a put-on, or doing music that draws on the most familiar influences that have been mined by thousands of artists before. It's not hard to tell if someone is making music that he or she has a great love for, or just trying to hop on the stylistic bandwagon and be trendy. And unfortunately, the vast majority of mainstream commercial pop music exemplifies the latter -- artists who may have had some originality and passion, but who by the time get put out a record, lose it in a fit of stylistic imitation that fails to ring true, either from the performance, or most often due to a record production process aimed at the mass market. Fortunately, we seem to be in a period, however brief, that has made it possible for relatively unpretentious music to have a shot at commercial success. Hootie and the Blowfish, and Del Amitri who scored a surprise hit after 10 years of recording, have made large record labels a little more open to music that is not processed to the point of lacking any artistic integrity. This week's album is one of those enjoyable recordings that seems to have been made possible by the current opportunities for honest, unassuming music, or what has come to be called "roots rock" or "Americana." It's by singer-songwriter Neal Casal, a recording entitled Fade Away Diamond Time. Casal is one of those performers who covers familiar ground, but does it in such a way that he makes it sound fresh. In fact, as a relatively young performer Casal influences go 'way back, to the late Sixties and early Seventies. But instead of sounding intentionally or artificially "retro," this sort of thing seems perfectly natural with Casal. He does love songs reminiscent of Jackson Browne, with a casual high tenor vocal and an intimate-sounding little electric band to back him up. The sound hints at the Band with Bob Dylan. Also prominent on the album is a pedal steel guitar, giving the music a hint of country influence, but again more like Jackson Browne and early Linda Ronstadt than Nashville in the Nineties. And further echoing the Woodstock days is Casal's Dylanesque harmonica. There's a bit of a personnel connection to the early '70s LA country-rock scene through the presence of bassist Bob Glaub, who had played with Ronstadt on a couple of albums. Otherwise the band includes Casal on the electric and acoustic guitars, John Ginty on piano or organ -- no synthesizers, Don Heffington on the drums, and a pedal steel player named Fooch Fischetti. Casal's easy-going songs sound as if they could have been written anytime in the past quarter-century -- the style is simple, direct and completely ignores 90s pop music trends. Most of the time, the topic is personal relationships. Casal's lyrical style is usually vague and poetic in the 60s tradition. Another factor really contributing to this album's appeal is the production by Jim Scott. The photos in the CD booklet show the recording taking place in a house in Santa Ynez, California, and the relaxed feel comes across in the recording. Another really nice aspect of Fade Away Diamond Time is the sonic treatment. Scott used virtually no reverb or other electronic effects, so the recording sounds very intimate. Casal has an appealing voice that doesn't need effects, and recording him that way further underscores the album's musical honesty. The album ends with a melancholy country-influenced waltz called Sunday River, featuring good wordcraft, and a particularly engaging vocal performance by Casal. 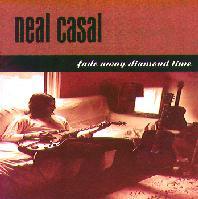 Neal Casal's new album Fade Away Diamond Time is a record that features almost no ingredients that haven't been used many times before. But the album's charm is in its execution. Casal draws on tried-and-true influences and sounds that have kept singer-songwriters engaged since the 1960s, and adopts them in a style that somehow does not come off as sounding intentionally nostalgic. Instead, the album has a thoroughly honest and unpretentious quality from its literate lyrics, to Casal's laid-back vocals, to the timeless-sounding instrumentation, that all comes off as completely natural and sincere. Sonically, the album is also a real gem. Its almost complete lack of electronic effects further gives it a warm, intimate sound that enhances Casal's easy-going musical persona. Producer Jim Scott deserves a lot of praise for his sonic restraint. Fade Away Diamond Time is the kind of record whose music Baby Boomers will swear they have heard before somewhere in the distant past, but at the same time, the album is very much the work of a younger performer in the 1990s. About the only complaint I might have is with the musical similarity among some of the songs, but taken as a whole, the album is the sonic equivalent of a favorite old pair of slippers that turn out to be brand new. Click Here for a review of Neal Casal's second album Rain, Wind and Speed.